Who knew the GOP cared so much about what coal mining does to West Virginia’s environment? I think I’ve gotten two of these anti-Jim Justice fliers so far, both mailed to the house by the Republican Governors Association’s PAC. 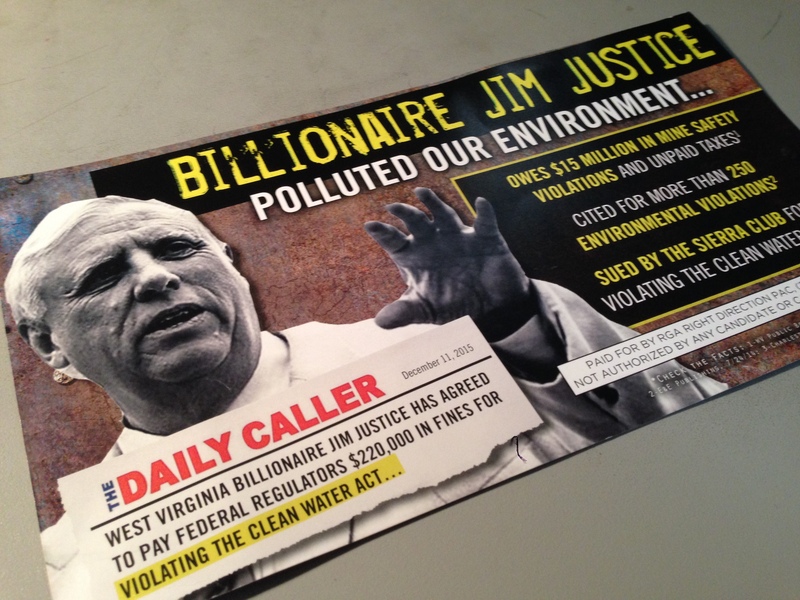 “Billionaire Jim Justice Polluted Our Environment,” they scream, before listing environmental violations at Justice’s mining operations and noting a lawsuit against the Democratic gubernatorial candidate by the Sierra Club. This is how silly this election is — certainly in West Virginia, but also elsewhere in the coalfields and beyond. It’s true that Justice’s company has had some run-ins with government regulators over his compliance with environmental rules — and not just at his coal mines. Justice had some problems not so long ago with dam construction at one of his resorts. And of course more recently, there was a pretty significant penalty to resolve water quality violations cited by the U.S. Environmental Protection Agency. As we’ve written here before, though, these kinds of violations are — unfortunately — pretty routine in the coal industry, where violations of environmental standards and worker health and safety rules are, really, part of the basic business plan. Most of the major coal producers in the state have entered into similar deals with EPA. The only difference with this one (other than it involving a gubernatorial candidate’s company) is that the EPA required some specific financial commitments, given … well, probably given the well-documented pattern of Justice not to pay his bills. Since the local Republicans so desperately want every single election this cycle to be about President Obama and the EPA, and their supposed effort to eliminate the coal industry, shouldn’t the GOP be lining up with Jim Justice here, to protest the outrageous overreach of those bureaucrats who want the Clean Water Act enforced, and don’t think the coal industry should be above the law? “Justice had some problems not so long ago with dam construction at one of his resorts.” Relevant detail: he built more than half a dozen illegal dams on Turkey Creek in Monroe County, a primo trout fishing stream, thus retaining the trout for himself and his friends while depriving downstream fisherman of the excellent trout fishing they had enjoyed for many years.